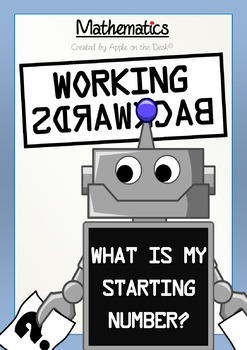 Math: Working Backwards - What's My Starting Number? 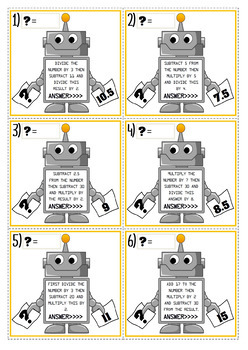 This fun activity is great for helping students solve 'I'm thinking of a number' riddles. 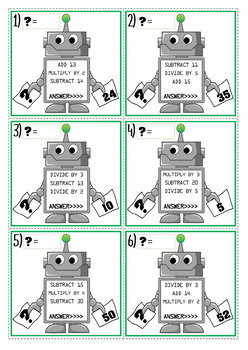 The worksheets are differentiated and include 4 levels of difficulty - from clearly presented problems, to more complex questions involving decimals. The students are given a final answer, and the calculations performed on the number, and need to work out what number each robot started with. They must work backwards through the problem, performing the inverse operation to find the original number. No prep - just print! 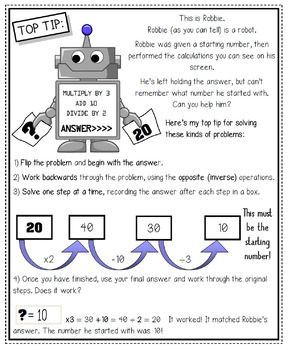 The activity is ready to be printed and used and comes complete with a full answer sheet. I like to give my class two of the sheets - the first so they can understand the process, and the second to really challenge their maths skills!